Fresh off the release of the T.V. series 'DOOMWATCH' finally hitting DVD by Simply Media, now Screenbound are set to release the 1972 movie in a newly restored DVD and Blu-Ray that will be released 20.June.2016. both will be region free. 'DOOMWATCH' was directed by Peter Sasdy (who is well known for directing Hammer's 'TASTE THE BLOOD OF DRACULA' and 'HANDS OF THE RIPPER') takes the T.V. series one step further. 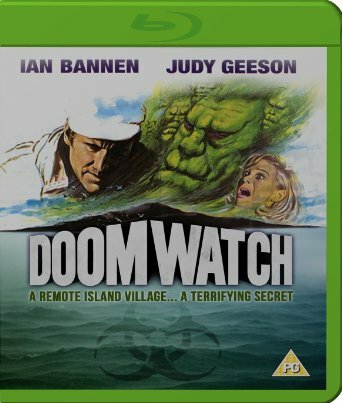 The acclaimed feature film of the BBC TV series in which Dr Del Shaw (Ian Bannen) of Doomwatch - the British government's environmental monitoring organisation - travels to the island of Balfe to investigate pollution. A year earlier an oil tanker was holed and its cargo contaminated the local waters - but has there been any adverse long-term effects? The villagers are all suspicious of Shaw, especially the menfolk, who seem to have transformed into near-neanderthals. 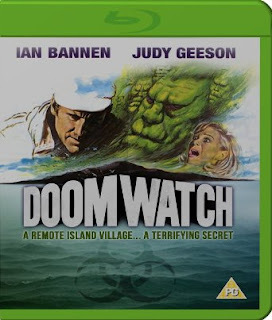 Samples of the local fish sent back to Doomwatch prove to be unnaturally large, and after teaming up with a local teacher (Judy Geeson) Shaw discovers that the transformation of the men is due to a rare disease called acromelagy. Co-stars Percy Herbert and George Sanders. For those who are a fan of the T.V. series this will be a welcome entry to your collection and for those that will see it for the first time you are in for a treat. You can read our reviews of the T.V. series at the following links.